The last time that I saw Lefty was in October 1970 at Memorial Stadium in Baltimore, where he threw out the first ball at the World Series game between the Orioles and the Cincinnati Reds. My son, Bob, and I were there. We looked over to the box along the third-base line where Lefty was surrounded by security guards. An adoring public tried to get closer to him but he was being guarded carefully. 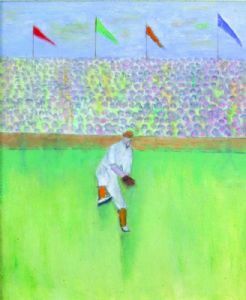 As this tall, gray-haired hero of baseball stood to pitch the ball, the crowd cheered loudly. Somehow we worked our way toward Lefty. Others were trying to reach him, too. But we inched along and got close enough to identify ourselves by saying "Lonaconing!" Lefty immediately stood up, turned to us smiling broadly. He greeted us warmly saying, "Hiya, Ruth. Hiya, Bobby." Lefty's big hand enveloped mine, covering it completely. I do not remember who won that game. But I came home with cheers for Lefty ringing in my ears and with memories of the flags flying and the band playing for the man who had retired twenty nine years before —after making baseball history. ...from Ruth Bear Levy, "Reflections of Lefty Grove", Maryland Historical Magazine, 1988. The Pitch was included in this article.